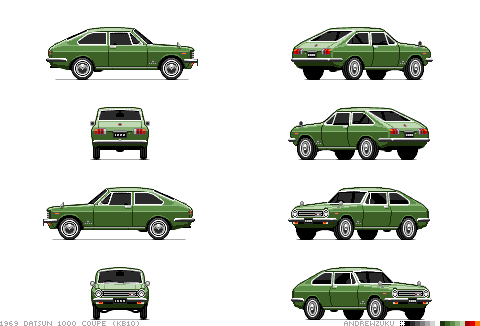 Here's another variation of my Datsun 1000 pixel car. The Coupe (KB10). This all got started when I purchased a couple of JDM brochures for my RA28 Celica. I'm now completely obsessed with old Japanese cars. Basically, if it's Japanese and had chrome bumpers, I love it! Like us to get notified when new stuff goes up!